Hi, finally. No excuses except I have been distracted from the computer. So many pretty days and things to do. I guess that's a good thing! Today I have a recipe for you. A few weeks ago I went to see my Mom in Clover and picked up some baby lima beans (What I like to call butter beans!) at the local produce stand. What to do with them? I scoured all my cookbooks and ended up with what Deborah Madison called Lima Bean Ragout and what I call succotash. She called for tomatoes but I am not fan so I skipped them. Butter beans and fresh corn, what's not to love? I ate mine over rice with some avocado and smoked salmon. A perfect summer dinner. The recipe is at the end of this post. I met a friend for breakfast at a great little place called Table. in Asheboro. We have a meeting in there every Thursday and this little place makes the drive even more worth it. I rarely eat sweets like this but we were celebrating her new job, so I splurged. A beautiful latte and almond brioche. It was so good - very soft and moist and almondy but not too sweet. A wonderful treat. 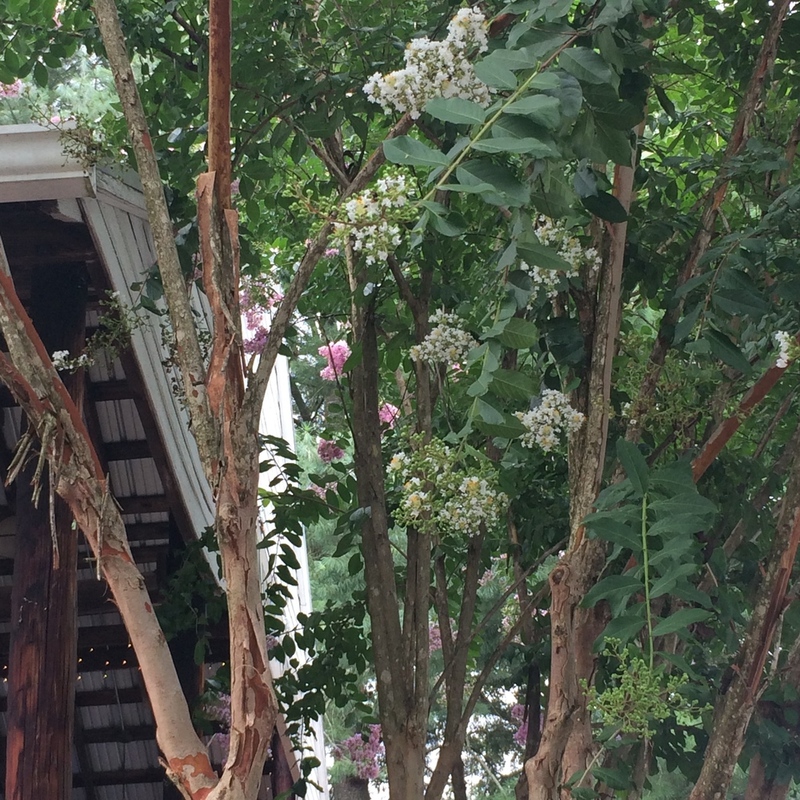 The season has moved on to full blown summer and that means Crepe Myrtles! The streets are lined with them in all colors of white, pink and purple. Mine are just starting to bloom but should be there soon! In Houston they routinely practice "Crepe Murder" where they severely prune the top off all the trees. 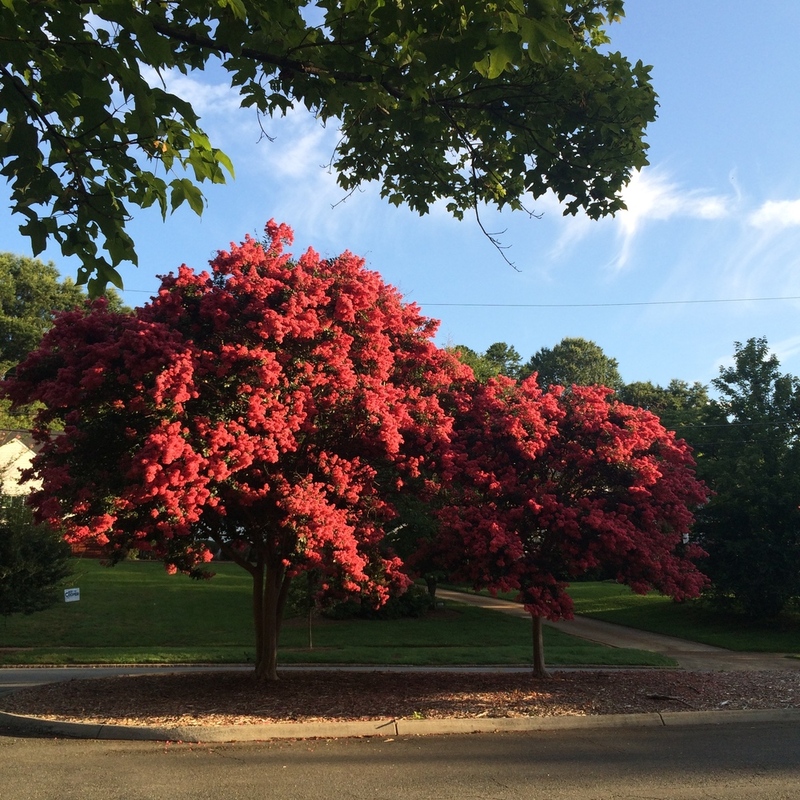 Here I have only seen one place do that and subsequently, they all grow huge and full and bloom like crazy. What else....I made some jam! I bought this cookbook (Canning for a New Generation) that recently came out in paperback. I tagged about 5 things to make and so far I have done two. Blueberry Apple Jam and Apricot-Vanilla Bean Preserves. They were simple to make once you have the right tools. (You know, the tongs, the wide mouth funnel....) I love that the recipes are all small batch (these made about 5 1/2 pint jars) and are mostly low sugar. There are lots of savory things as well. I highly recommend it. 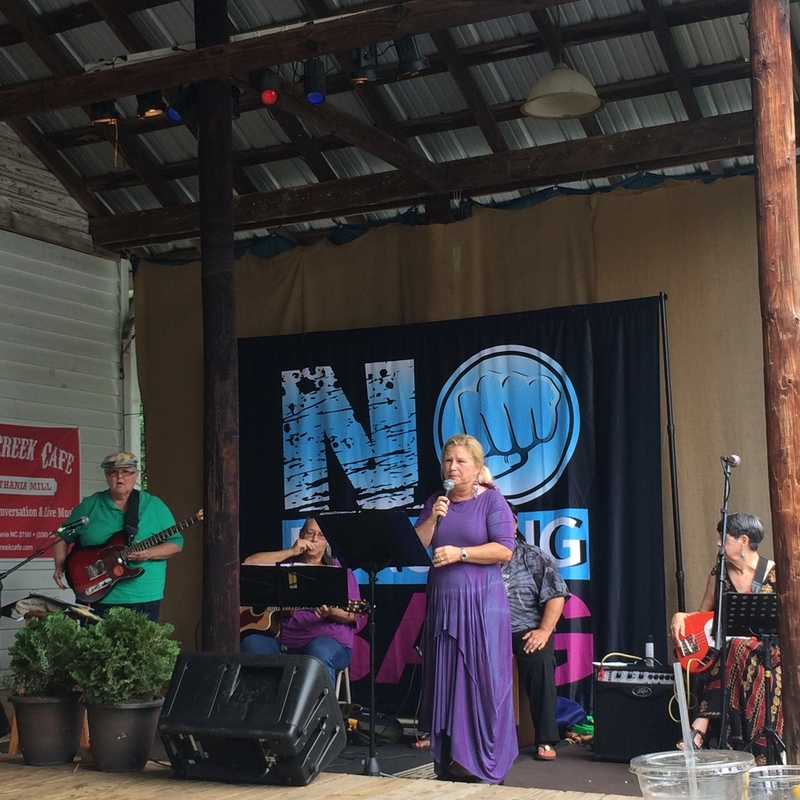 This past weekend I went to an all day music festival held to raise awareness of domestic violence. 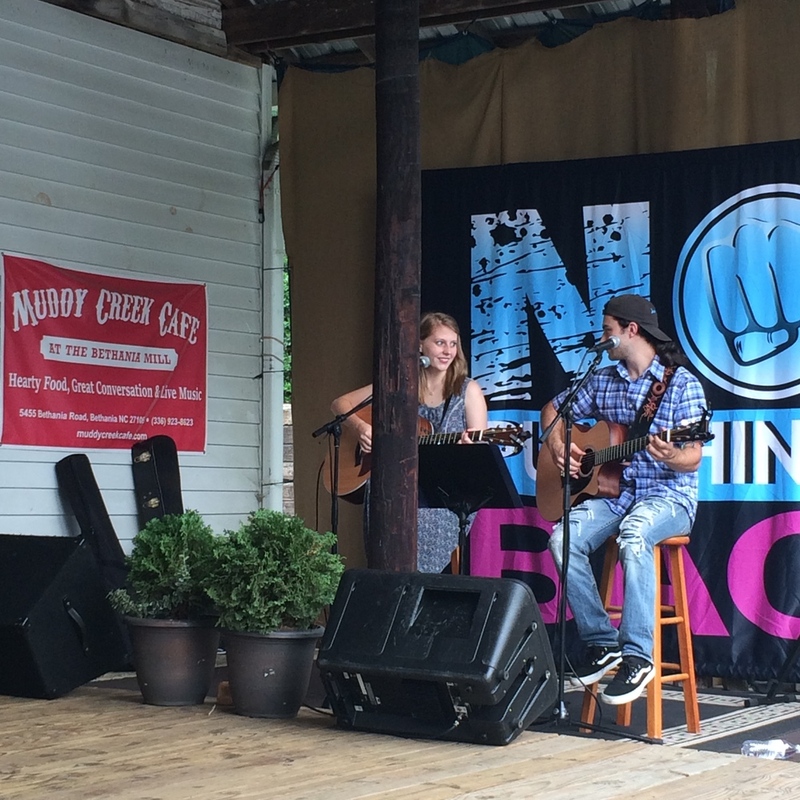 There were women-fronted bands or women singers all day long at a great venue called Muddy Creek Cafe and Music Hall, an old mill that is converted into a cafe, shops and a music hall. 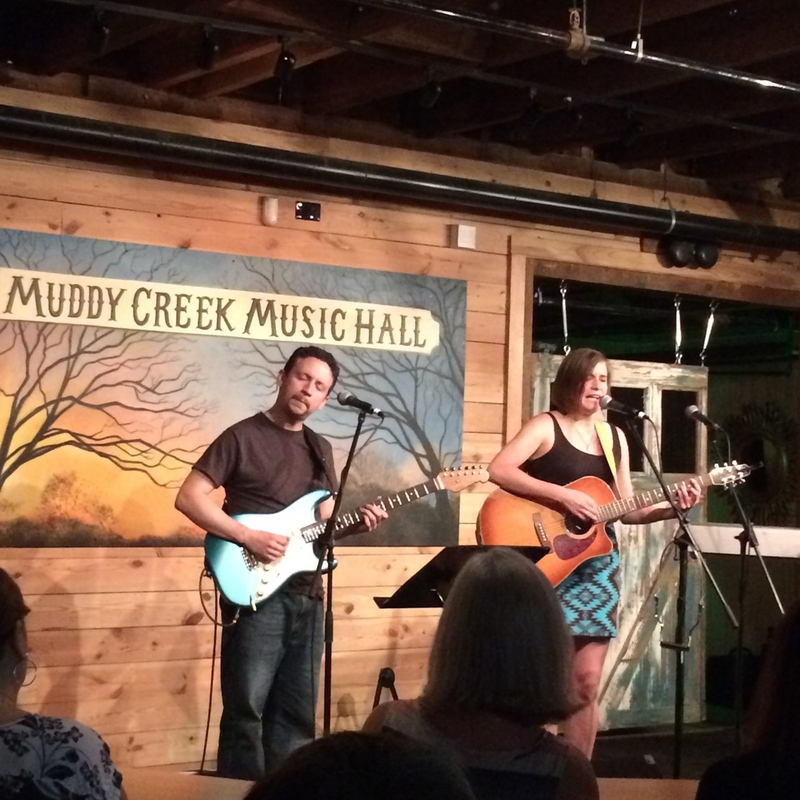 There were acts that performed outside on the porch and then two that performed inside the mill in the music hall. The music hall is a perfect listening room. It is all wood and is rather small so the sound is amazing. It is fun to be in because it still has a lot of the old equipment and stuff inside. I love live music so I enjoyed it all but some were better than others. The big group above was like the grandma version of a teenage garage band....they sure had a great time, but they were more people who know how to play and sing versus musicians. The last act I saw was amazing She is a new favorite. Leah Shaw is a singer-songwriter from Winston-Salem who now lives in NY. She had an amazing voice and is one of those musicians who can play everything. She said she trained on Basson as her first instrument, then piano and guitar. She can play the harmonica and the guitar, at.the.same.time.....a feat I can never understand. Anyway, here is a little video. I think you'll like her too. Lastly, here is your recipe. Enjoy! Put the beans, onion, bay leaf, parsley and oregano, 1/2 tsp salt, and 2 cups of water in a medium pan. Bring to a boil, reduce to a simmer and cook until the beans are tender, about 20 minutes. Drain, saving the broth. Remove the bay leaf, parsley, and oregano. In a large wide skillet, heat the olive oil over medium high heat. Add the green onions and corn. Cook until beginning to color and soften, about 4 minutes. Add the beans, the herbs, paprika, a big pinch of salt, and bean broth. Stir well. Cook over medium heat for about 6 minutes, until everything is tender and most of the broth has absorbed. Taste for seasoning, adding more salt and pepper as needed. Serve over rice, biscuits, or on its own as a side dish.